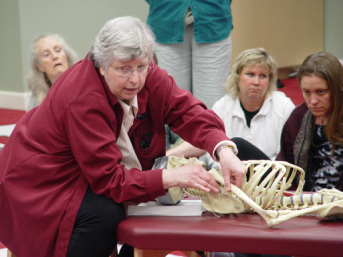 The Anat Baniel Method is based on the work of Dr. Moshe Feldenkrais. Gentle movement, concentrated with attention with teach you efficient, pain free ways to move. Our body is designed to bear weight through our skeleton and our muscles do too much work. As we age we develop bad patterns of movement causing us injury, pain, and stress. Our private lessons and group lessons work with the brain to access the skeleton and the bones to get your whole system better organized, which helps you get out of pain and let go of chronic habitual, unnecessary muscle contraction and tension. The best thing about Awareness Through Movement rather than other models and methods is it doesn't hurt to do and anyone can do it! If you can't get down on the floor to do a lesson we have two tables available by reservation for group classes. Read more about the method www.anatbanielmethod.com.